parking her six-speed in Clermont on Main Street. I wait and look for elderly Americans, but there’s nothing. This is kenopsia1 before I knew the word but first felt it. all the antique shops run by ex-snowbirds. Then she flies me down the hill to the water’s edge. There are usually waves, she says. Another thing missing. to see her nested in the land of sweltered days and 4 PM rain. she doesn’t feel like going down to the pool. the DVD proving Heaven to be true. down the Eastern Seaboard. New England: A home once. Then a ten-year Virginian detour in a little yellow birdhouse. and I’ve never been convinced of your reasoning. and then to chase love South, the fear of losing him. I notice that your plume don’t look so good, mother. 1n. the eerie, forlorn atmosphere of a place that’s usually bustling with people but is now abandoned and quiet. The Dictionary of Obscure Sorrows. Lauren Paredes is a storyteller across mediums with a soft spot for the unusual. 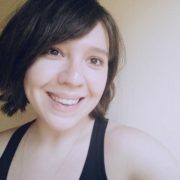 She received her MFA in Creative Writing from Lesley University, and her work has appeared in The Gold Man Review, DigBoston, Spark and Fizz, and the upcoming Grapple Annual No. 2. She currently resides in Portland, Oregon.